Welcome to our Studio, where sustainable design dances with elegance and exquisite detail in this lovingly handcrafted haven. Located in the heart of the gas-lamp lit district of Beacon Hill (Boston's most historic neighborhood) the Studio represents the owners' (a husband-and-wife design team) philosophy of walking softly on the earth while living passionately and luxuriously - yet, without excess or waste....the truest measure of 'being green'!!! Experiencing this well-designed small space provides clients & guests alike with a heightened spatial awareness of what is truly necessary to live well. Particulars: Top (4th floor walk up) apartment has large sunny windows on all sides. Facing distant rooftops and the sky, you'll wake to birdsong and quietude in the Queen size mahogany custom built-in 'window bed' even tho you're in the heart of the city. There's also a full size washer & gas dryer in the apt. The tiled, windowed bath has tub & shower w/ amazing water pressure; nickel fittings. An eclectic library and music collection & Vermont Castings gas stove to take the chill off cool nights complete the ambience of the Studio. There is space for 2 yogis to comfortably practice in the central floor area in front of the fire..... The large antique desk faces East & granite kitchen counter provides comfortable dining for 4-6 or use as a 2nd work/planning space. Practical Bits: 5-10 minutes' walk to Boston's 'Red' or 'Green' Subway Lines (the 'T'), Charles Street fine dining, coffee shops, boutiques, flower shops, chocolatier, pastry shops, wine & liquor stores, etc; 10 minutes' walk through Beacon Hill to the new Whole Foods grocery store; 20 minutes' walk through the Boston Common & Public Garden to the shops on Newbury Street & Prudential Center. 15 minute walk to North End Yoga Studio for excellent Vinyasa Flow classes. Remember to support our local organic farmers May thru October when the Farmer's Markets come to Copley Square & Government Center twice weekly! Please Note: Our Architect's Studio is available for monthly bookings only. Many thanks for reading all the copy! We're a husband/wife architecture, preservation & interior design team based primarily on Nantucket & in Boston & Asheville NC for the past 20 years. Creating sacred spaces is our passion ~ We believe that 'Home' is the Wellspring from which a balanced & harmonious life springs forth. Luxury without excess; tiny footprints; having 'enough…' Being mindful that everything is both useful and beautiful. Further, that Harmony on the Earth truly begins with harmony at Home. The energies & the Beingness of Home as partner inspires and informs our lives & our designs. Beacon Hill is the heart of one of America's oldest historic districts & one of America's truly great walking cities. 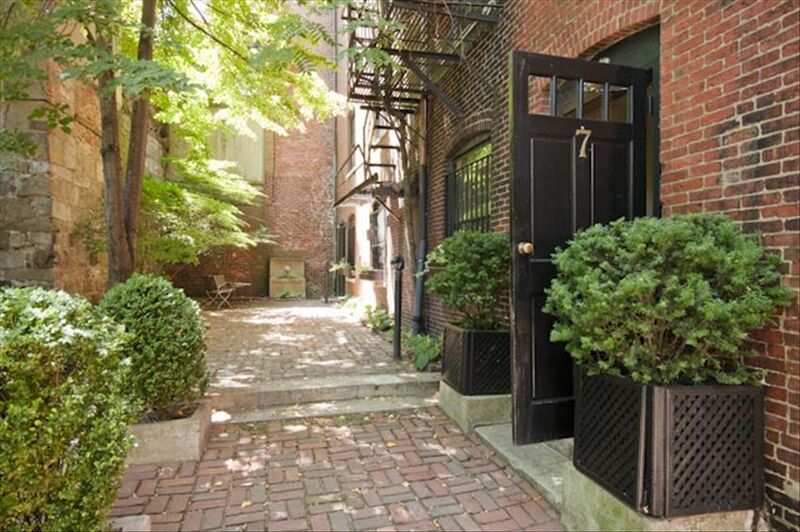 The collection of Federal architecture in Beacon Hill alone is one of America's treasures! Walking the Freedom Trail connects you to the Nation's pulse & the collective consciousness of hundreds of years of habitation in this great experiment of Democracy... A true sense of Community still exists in Beacon Hill; it's a village of 10,000 residents. The Architect's Studio is a Sanctuary of Peace & Serenity. There are many angels flying around! Elegant, green, luxury in 310 square feet...Your spatial awareness will morph in the Studio. Private Roof Garden views of Charles River & Boston skyline. Centrally located, within 10 minutes walk from 3 major 'T' stops; 5 minute walk to the new Whole Foods; 5 minute walk from Charles Street shops & fine dining; 15 minutes walk to the North End; 20 minute walk to Boston Public Library & Farmer's Markets May thru November. North End Yoga (home of 'Boston's Best Yoga Teacher,' 2010) is 20 minute walk thru Beacon Hill to the North End. The Studio is absolutely enchanting. The bed is very comfy and the unit has everything you need. Peaceful, serene environment. We take great pride & pleasure in sharing our Beacon Hill Studio; it represents all that is possible in a space of its size, light, luxury, and style. Virtually every guest has thoroughly enjoyed their time at The Studio, and even some find that they'd rather "lounge" in there than explore all that Boston has to offer. It is surprising & disappointing when, on the rare occasion, someone doesn't "get it." On this HomeAway website, there are over a dozen photos of our Studio space, showing exactly what we offer, so I'm not sure why this particular guest was expecting anything different. Our building, as nearly every other building in Beacon Hill, has no elevator service. Our stair is one of the more comfortable in the neighborhood, as it's wider than most & has graceful curves, rather than the typical right angle winders. We offer a full chief's kitchen with gas stove & high quality cookware & a toaster oven; we do not have or advertise having a microwave per health concerns. There is a 4 level garage one block away with short & long term parking. Beacon Hill, like most neighborhoods in Boston has resident parking with some meter parking & many parking garages. I'm truly sorry that this guest had issues & could not enjoy our Studio as most do, but this was not due to any shortcomings of The Studio. OK, I don't know if I should write a review about this place or the two wonderful owners, Deb and Angus. I've rented many accommodations from VRBO and other sites, but my wife and I have never had as pleasant of an experience as we did with Deb, Angus, and there home. We were greeted by Deb and Angus out on the street for a helpful orientation of parking and the beautiful, safe neighborhood. From there we got the tour of the building, and the rental. They went out of their way to make us feel like this was our home. After we parted ways, they showed back up with some goodies from the local deli to get us started. Who does that!? They did. My wife and I were celebrating our 20th anniversary, and after an exhaustive search on VRBO this seemed like the right place for us. I couldn't have imagined how pleased I was going to be at the time I booked. I hope to keep in touch with Deb and Angus as friends. That's the kind of people they are. So, if you're looking for a place in Boston, no worries about what you're getting here. You won't be disappointed. Thanks my friends! Recently we were blessed with the opportunity to spend some time as guests in this unforgettable studio retreat. In every detail we felt the energy of the beautiful souls that both designed and built this amazing space. Exhausted from our travels we INSTANTLY felt REVIVED! From that first moment, we KNEW we were exactly where we were supposed to be! The soft music, the warm glowing candles, the smell of amber incense flood over us and we actually take the time to stop and appreciate it ALL! We could have spent our entire vacation within these walls. We came feeling exhausted, when we left, we were filled with peace and pure joy!